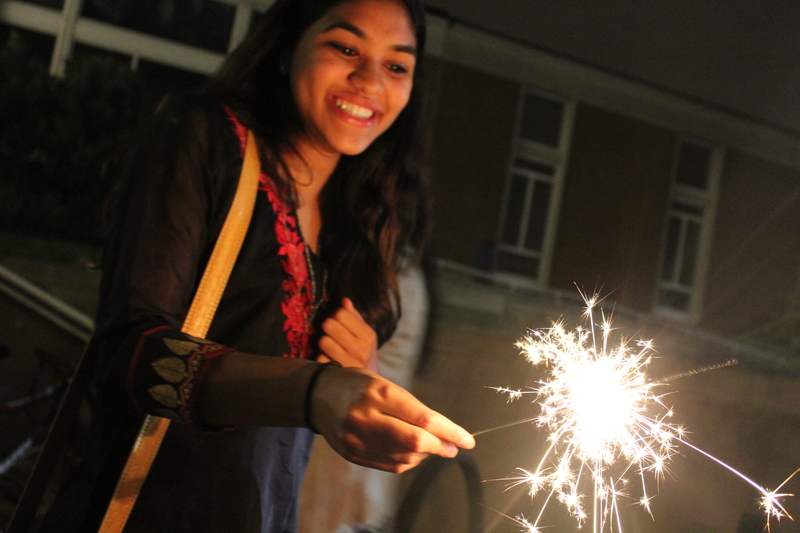 Students celebrated Diwali, the Indian festival of lights, with some students and families burning sparklers, a common practice. More than 2,000 people attended the Hindu Students Council’s (HSC) annual celebration of Diwali, the festival of lights, in the gymnasium of the Ralph S. O’Connor Recreation Center on Saturday. In keeping with Hindu practices, attendees were asked to remove their shoes before entering the gym. “[It’s] a Hindu tradition that when you go into a house or a temple. And this [the gym] is kind of emulating a temple because we have some idols in the center, so you take off your shoes to show respect,” junior Sumukh Bharadwaj, an HSC board member, said. The main event of the evening was a Hindu ritual of worship, aarti. Attendees gathered around a table upon which statues of the Hindu gods were mounted. In addition to prayer, the event also featured free food, including samosas, gulab jamun, a traditional South Asian dessert and daal, a lentil dish. Another way Indian culture was fused into the event was giving attendees the opportunity to have a sari, a South Asian female garment, and a pagh, or turban, tied on for them. “The purpose of the sari-tying event was to have fun while simultaneously spreading Indian culture,” sophomore Sharmini Premananthan, who volunteered to tie saris, said. Later in the night attendees gathered to watch performances by South Asian dance groups JHU Shakti, Blue Jay Bhangra, Zinda and JOSH. In addition to celebrating South Asian and Hindu culture, the event also had a charitable aspect. The Lotus Life Foundation, an organization that donates medical supplies to impoverished children in India, where childhood illnesses and infectious diseases are common, asked attendees for donations at the entrance to the gym to support their efforts. The gym was packed with people only an hour after the event began. Shah explained that HSC likes to make the event family-oriented. “The actual holiday is on November 11th this year. It’s on the lunar calendar, so it changes. But we like keeping it during Parents’ Weekend because a lot of parents really like this event,” Shah said. Sophomore Tara Blair brought her family to the celebration. “I thought it would be a fun event for my family because in high school a lot of my close friends were Indian so I got to experience their culture and wanted the same for my family,” Blair said. Blair’s mother, Teresa Blair, had a positive experience at the event. “My family and I enjoyed seeing many of the students and even some parents dressed in their festive traditional outfits. I thought it would be nice for my high school daughter to see the traditional Indian dance, as she studies dance, but unfortunately we didn’t get to stay that late,” she said. Blair praised the event organizers, citing the free food. Though the event is planned over Parents’ Weekend, and several students whose parents did not visit attended and enjoyed the event. Sophomore Gita Lakshminarayanan agreed with Chandrasekar’s sentiments. “I like connecting with my culture and celebrating part of my heritage,” she said. Other students just wanted to see the performances, eat free food and find out what the event was all about. Freshman Samavia Khan attended the event knowing little about Diwali. The event ended with the lighting of sparklers outside of the recreation center.